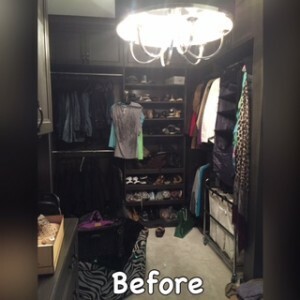 Large walk-in closet with great storage. Just needed some TLC. 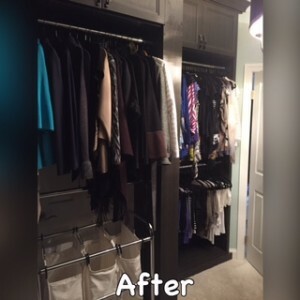 Yesterday, I organized this fabulous closet in Potomac, Maryland (no, not a home of one of the Real Housewives). 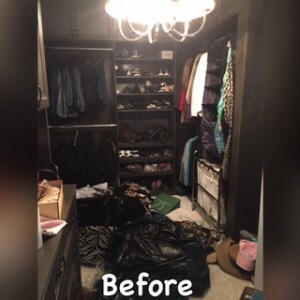 Obviously, this is a great space to work with - my client just needed some help organizing her wardrobe that made sense, allowing her to easily locate the pieces she had in mind when putting together her outfits. A lot is hung up with no real rhyme or reason. 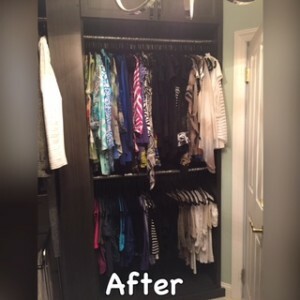 Coats, outerwear, storage, oh my! In progress... It gets worse before it gets better! I had already worked with this client in the fall. We did a full edit of her closet - pulling out items she no longer wore, liked, or didn't feel fully confident wearing. After spending much of the winter months in Florida (lucky!) she was ready for a good spring cleaning, and took advantage of my 15% off special. We did take a few minutes to edit her shoe collection - and we ended up with a HUGE bag of pairs to donate. Some woman in the D.C. area with size 11 feet is about to hit the footwear jackpot. I got to work separating her clothes into fall/winter and spring/summer areas. I organized her summer tops together by color, with summer bottoms right below, also by color. Then, I moved on to her fall/winter items. I separated her tops by color (enough black for a full section!) and hung her workout sweatshirts and arranged them by color as well. Moving on, I tackled her 2 shoe closets (not pictured), the shoe wall, and what I am now calling her "denim bar". I organized her shoes into fall/winter, spring/summer, and athletic/street shoes. The spring/summer shoes went on the shoe wall since they're currently in season. 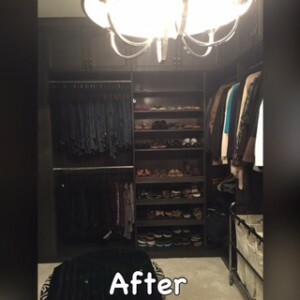 Fall/winter and the athletic shoes went neatly into the shoe closets. I refolded and hung all the jeans - blue ones on top arranged by shade from darkest to lightest. On the bottom were black jeans, and other pants all arranged by color. "Denim bar", other pants, and shoe wall. Last item of business was the wall of jackets, coats, and outerwear. I arranged these items by color and removed organizational bins that no longer served a true purpose. A little over three hours, and my work here was done. It's tough to get a photo that really does the whole job proper justice since the space is difficult to get a view of the entire closet. 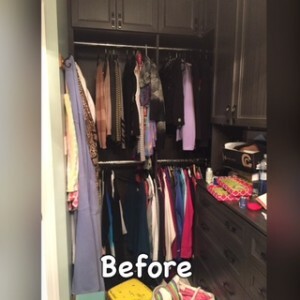 When I revealed the final product to my client, she hugged me and said, "It's the closet I've always wanted!" I'm thrilled that she was so pleased. Great job! Just what every man and woman needs! Can I get on your list to do? I love my closet!!! Couldn’t be happier with Colleen!